“Whenever there is decline in righteousness and rise in unrighteousness, O Bharata, then I send forth Myself. Sadgurus or Perfect Masters are in reality, the seers who have realized the Absolute or have reached the highest realm of spiritual attainment, are present for ever in the whole universe whether in an embodied or in an un-embodied state. They can operate in gross, subtle, or mental world. They have been actually chosen to execute the Divine Mission and for that, free from individual ego, work together for the execution of the Divine Mission. A Sadguru is the one who leads the created to the creator. Their actions are universal in nature cutting across religions, nations and all divisions of society. In fact the descent of the Divine in human form is to create conditions for the human to ascend to his Divine essence. Everything that happens is but the expression of the Divine Will and the descent of the Divine energy and the ascent of the human aspiration are mutually complementary. Shri Krishna recommended, we should approach the wise Teacher “Learn THAT (Eternal Truth, the Brahman) by humble reverence, by inquiry and by service. The men of wisdom who have seen the Truth will instruct you in that wisdom”. Sadgurus are infinite existence, infinite knowledge and infinite bliss. The Grace of the Guru is the root of salvation. The Sadgurus or perfect masters are born at different times in different places and with different cultural backgrounds. Strangely enough their external situations may be widely variant but their actions in their embodied stages display a common theme and common approach to solve the human problems. 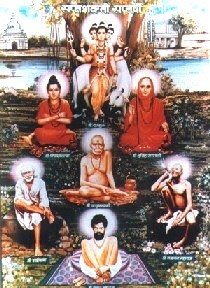 Shankar Maharaj, Hazrat Tajuddin Baba, Narayan Maharaj, Meher Baba, Hazrat Babajan, Shri Gajanan Maharaj of Shegaon, Shri Upasani (Baba) Maharaj, Shri Manik Prabhu Maharaj, ParamSadguru Shree Gajanan Maharaj of Akkalkot, Shri Krishna Saraswati Swami, Swami Swaroopanad of Pawas and Shri Vasudevanand Saraswati Swami Maharaj.